You are going to see in the next couple of years the worst bear market in your lifetime. It is going to be very, very bad. We have dire circunstances coming. I am not saying a recession could be looming. I am saying a recession is on the horizon. You will see it certainly by next year. Almost every time you buy panic you are going to do okay, as a trader or as an investor. It might be even better for the trader because you can just jump in and buy and then when the rally finally comes, it can be in the next trading session or in the next month, a trader sells. There are problems facing the world. Of course we are going to have a recession. It is not unusual. We`ve had them every 4 to 7 years since the beginning of the Republic. There is nothing unusual about that. That is the way the world has always worked. The Commitments of Traders (COT) report shows that gold speculators own records amounts of gold ant that is why I am not buying gold right now. A number like this is usually a contrarian indicator. If Donald Trump wins the upcoming election and he really does what he says he is going, things like trade wars then it is bad news for the world. The problem is that trade wars always lead to bankruptcy and often led to war. If this happens you would be better off owning a lot of gold. I have always tried to look at the world as it is not as I am told by propaganda and the media and other people. I try to teach my children, do not listen to anybody, look at everything and decide for yourself. I have been doing that for a long time. Russia wants to cut oil production but I would not do that. I would let the market sort it out. It may take some time but the reality is that the high cost producers (framers, deep water drilling, oil sands) are stopping exploration and going out of business. The Russian Ruble (RUB) has hit bottom as far as I am concerned and crude oil is making a complicated bottom. I would rather buy the Russian Ruble (RUB) than just about any currency right now. 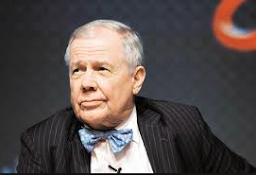 Jim Rogers: "I Am Shorting Stocks In The United States"
People should only invest in what they know about. You should not listen to me or somebody else. If I say to buy "X" and you do not know anything about "X", do not think about investing in "X". Stay with what you know. I am shorting stocks in the United States, I am short junk bonds, I am long China, I own some Russian shares, I own agricultural commodities. I own some gold and silver but I am not buying them right now. These are some things I am doing now. Some things that I see in the future that are great? - I am bullish on Agriculture. - China is a very polluted nation. Anybody that can clean up China is going to make a fortune. - Asian Tourism has a huge future because there are so many Asians now that are able to travel. Those are some of the industries of the world that have a magnificent future. Negative interest rates are a disaster. These guys (Central Bankers) are ruining the people who save and invest. Everybody reading this, their parents taught them to save money and invest for the future and you will come out O.K. - Well many people do that but they are being wiped out because they are owning no return on their money. It is a disaster. There is no way America can meet its obligations. America is the largest debtor in the history of the world and the debt is going up daily. Wether we are talking about Pension Plan, or medical care or just interest on the debt, you name it. Our debts keep going higher and higher. Do the math, I do not want to sound like a fear mongerer or something, just do the arithmetic, you can add this as easily as I can.